I'm back with another card from the fabulous Yay for You Card Kit. This amazing kit will be available on Tuesday, Janaury 23 at 9:00pm EST. 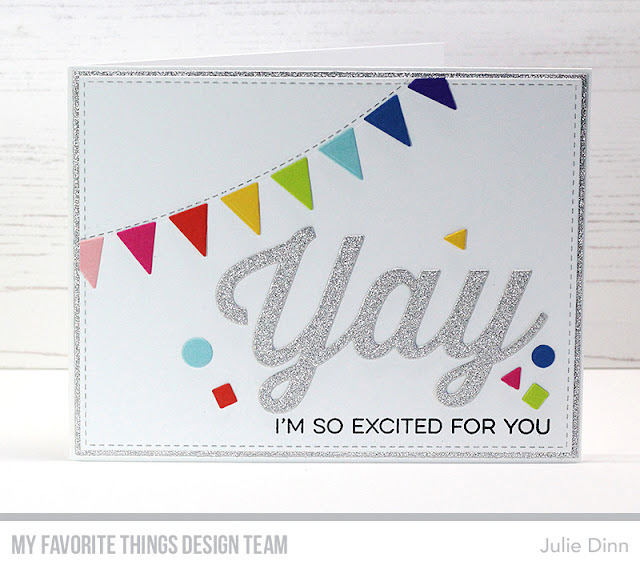 One of the reasons I love the new Yay for You card kit is the So Many Yays Die-namics. I love the three different styles of yays included in this set. I used the script version for my card today. The banner at the top of my card was die-cut with the new Celebratory Banner, it's the new Free with $60 Die-namics. Pretty card! Love that scripty YAY. The colorful banner perfectly enhances the wonderful YAY! So festive with the sparkly YAY and the colorful banner. Fun and bright. The banner diecut is the perfect accompaniment. Great use of color! Love the banner!